Build it. Light it. Feel it. Feed it. Fall FIRE! 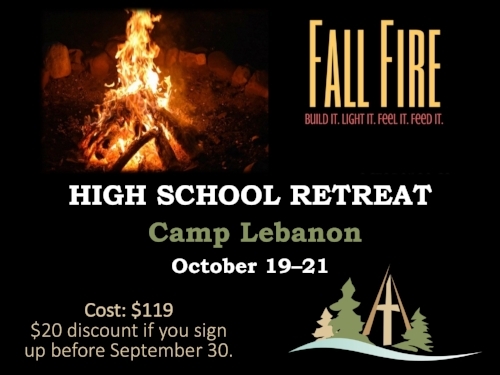 is a Senior High youth group retreat designed to build teamwork and equip students for an amazing school year! We will have dynamic teaching in chapels and break-out sessions, as well as exciting activities such as the RAGING FIRE group challenges, the MIGHTY, MIGHTY SCOOP NOODLE CHALLENGE, and Laser Tag! Not only will we have the funnest fun at camp, but we will also leave ready to take on what this next year has in store for us! Cost $119. Bring money for two meals on the road. REGISTRATION IS NOW CLOSED.